PHILADELPHIA (WPVI) -- Deli Deli! Dietz & Watson is giving away free meats and cheeses during a pre-Super Bowl live-stream. 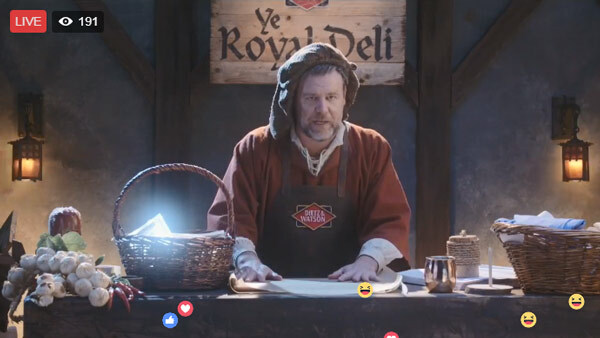 In a spoof Bud Light's 'Dilly Dilly,' Philadelphia-based Dietz & Watson has opened up their Ye Royal Deli. Viewers on Facebook, Twitter, and YouTube can watch the stream and place their order. Dietz & Watson is selecting a lucky few every hour. According to the rules, " D&W products awarded in the form of several high-value coupons for twenty-five (25) years from winner confirmation. Coupons awarded per year in the value of $49.99 per month." Some famous names have already taken part in the fun including Jamie Foxx. "Did I just get free sliced turkey from @dietzandwatson? Yes. Are they giving away free meats and cheeses all day? Yes. #DeliDeli"
The stream is set to end around kickoff.